Visitor Centre & Tea Room at Cadair Idris (NRW)0300 065 3000work Visitor CentreCadair Idris Visitor Centre and Cadair Tea Room are 250 metres from the car park and the Minffordd path to the summit passes by them. The visitor centre houses an exhibition showcasing the wildlife, geology and legends of Cadair Idris National Nature Reserve. 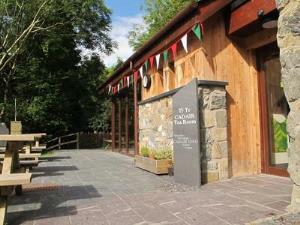 The centre is owned by Natural Resources Wales, and managed in partnership with the staff of Ty Te Cadair Tea Room. Cadair Idris Visitor Centre and Cadair Tea Room are 250 metres from the car park and the Minffordd path to the summit passes by them. Dôl Idris car park is situated near the junction of the B4405 and the A487. The car park is managed by Snowdonia National Park and there is a parking charge.